To live even briefly on my own resources I will need fresh water. This project investigates my own ingenuity, constructive capacity and basic scientific knowledge. It celebrates playfulness and the recycling ethos to address the idea of waste as resource, marrying Dr Suess aesthetics with postconsumer debris. Residents and visitors will be invited to participate if they wish. I will collect materials that have either washed up on shores of the island or have been discarded as waste and from this I will create ad-hoc water distillation units. These units will separate the salt out from seawater using solar distillation. Each distillation unit is made from found containers – a mix of aluminium cans and plastic bottles, tanks, buoys, bags, fishing nylon, wire and other detritus using low tech (i.e. handmade) construction techniques. The units are elevated above ground by driftwood or bamboo structures so I can check on them easily and to reduce the incursion of ground dwelling creatures. If birds come they will find perches. These structures are held together with lashing from fishing nylon painstakingly unknotted from tangles found on the beach or tied together with rubber tubing from recycled tyres, wire and rope. They will be site specific. Each morning I will carry seawater to the units. Each day the distilled water will be collected and the salt separated out will be removed, bagged and labeled. The structures and activity will be documented by photography, video footage and drawings, which will become a body of exhibition work. I will record daily statistics of temperature, sunlight hours, wind direction and strength together with the resultant water produced. This data will be mapped against my bodily requirements needed for the physical exertion of attending to the units for the same time period. Each unit will have a recorded log that notes these statistics and shows a net self-sufficiency or water debt for the duration of the exhibition. My work explores the impact of human activities on the environment and natural world as well as vice versa. I am interested in systems and the way things work or don’t work and in issues of sustainability and environmental concerns. In particular I seek inspiration from the ocean, rivers and lakes as well as flora and fauna. I have referenced water in the past by floating installations in ponds and had water flowing through a sculptural installation in another work for Connells Bay Sculpture Park. My Forty Year Project work in particular is about the problem of marine plastic and has several ongoing divisions, both photographic and installation based. My practice involves drawing, photography, video and installation/construction/sculpture. The 3D side of my practice predominantly uses found materials as I wish to minimize the carbon footprint of my art activities. 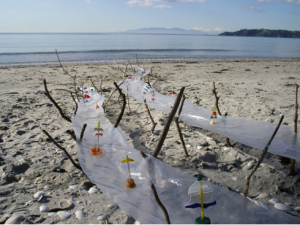 Sue Pickernell-Crow was born in Hastings NZ I am interested in systems and the way things do or don’t work, in the ‘natural’ and human manipulated worlds and their interface.